Welcome to our first of many giveaways! This week's lovely giveaway is brought to you by Honey and Pig. They're offering one lucky winner a pair of these fun and adorable hair pins! 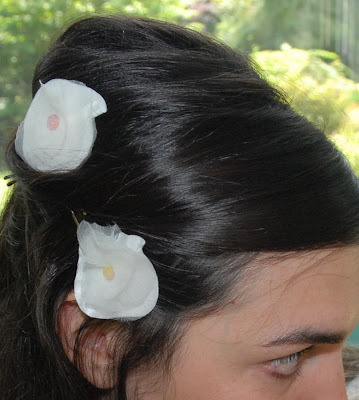 Wouldn't they be perfect for a bride, or just for a touch of whimsy on any given day? For a chance to win your own set of Honey and Pig hair pins, please visit the shop and come back here to gush about the items you like! One lucky winner will be chosen tomorrow. Good luck! *And the winner is Renee! Congratulations! Aren't the "Yellow Sparkly Flower's" - gorgeous! I love the hair accessories from the Honey and Pig shop! They're so cute and can be worn with anything when you want to brighten your day! I especially love the cupcake and cake paintings. I love the tulle flowers too!! I adore all the hair accessories, especially the little flowers! Jen giveaways, meaning something for nothing, well I am totally onboard for that. Checked out Honey & Pig and that inspires me further to start my own line of cards. I like the hair clip called Pinky as I'm a Red Hatter and it would go well with those outfits. OH... I love giveaways. I like the sparkly yellow flowers. So cute. The white one are awesome too. Love the multicolour one! They are all very cute! I think thet are very cute. I like to get different hair accessories for my daughter. I love the piece of cake! Oh, LOVE those pins! I also like the artwork. It reminds me of one of my favorite children's books. The Yellow Belly Clips are so cute!! But the white ones are also darling!! I really like these white ones for the giveaway. I think my other favorites are the Pinky hair clips! Now if I can win every other Monday giveaway that would be super awesome, because I am a real greedy guts.